The stars were certainly big and bright in the heart of Texas last night, as WWE Monday Night RAW was live in San Antonio. With the Summerslam picture coming closer into view, what did the WWE have in store for us this week? Let’s find out! After a rather surprising introduction to the position of General Manager, AJ Lee came out to the ring to announce what she proclaimed to be a stellar lineup for the night. Before she could get too far into the card, however, the GM was interrupted by WWE Champion CM Punk. The Straight Edge Savior initially appeared to be rather apologetic towards Lee, stating that he was out of line. He then changed course and called her decision to place him in a triple threat match against John Cena and Big Show at Summerslam a major blunder. He demanded to change her decision, which she quickly neglected. Punk fired at Lee, claiming that her decision was solely due to the fact that he rejected her marriage proposal a few weeks ago. The argument was interrupted by Mr. “Hustle, Loyalty, Respect” himself, who then accused Punk of turning into one of those sore losers who stomps around demanding respect. Cena and Punk exchanged insults for awhile until (SURPRISINGLY) the Big Show arrived with the apparent intention to beat both of them up. Before things could get out of hand, AJ Lee interjected by saying that she will not let things get out of hand on her show. She tells Cena and Show that they will have matches later in the night, which causes Punk to shout at Lee for not putting the champion in a match. The GM then tells Punk that he has a match, but she isn’t sure who it’ll be, because Punk’s opponent will be decided by the WWE Universe. Backstage, Alberto Del Rio arrived in the parking garage driving a pristine looking Ferrari. This will be important for later. Del Rio decided to confront GM AJ about his desire to no longer compete in matches until Summerslam. She tells him that he isn’t even scheduled for a match tonight, which causes Del Rio to tell sidekick Roberto Rodriguez something to the effect of “I knew she wasn’t crazy”. Upon hearing that Del Rio insinuated that she might be mentally unstable, she immediately changed her mind and places The Mexican Aristocrat in a match. Del Rio’s celebration was short lived, however, as World Heavyweight Champion Sheamus showed up on the titan-tron. Sheamus tells Del Rio that he has given Del Rio’s words some thought, and he agrees that he may be beneath the Aristocrat. He decides to remedy this by upgrading his mode of transportation. He is then revealed to be standing next to Del Rio’s Ferrari (told you that information would be important later!). He then tells Rodriguez that he really shouldn’t leave the keys in the car. Sheamus decides to take Del Rio’s car on a sight seeing trip around San Antonio and speeds out of the arena. Backstage, Damien “The Martyr” Sandow tells the WWE Universe that he intends to rid the WWE of any foolishness, such as dancing. Therefore, he will continue his onslaught against Brodus Clay in the ring. In AJ’s office, the GM is confronted by ex-fiancee Daniel Bryan. The Yes Man demanded that Lee make the main event for the WWE Championship at Summerslam a Fatal Four Way Match and include him. She responded by telling Bryan that he was already involved in a match at Summerslam, against Kane. Bryan yelled “No!”, AJ yelled “Yes!”. Rinse. Repeat. It was very funny. Since Monday Night RAW happened to be in town, The Heartbreak Kid Shawn Michaels decided to make his second appearance on the show in just three weeks. After going on about being out of shape like he seems to enjoy doing, Michaels thanked the WWE and talked about how amazing his reunion with DX was at RAW 1000. Michaels goes on the say that all the talk in the locker room is about the Triple H/Brock Lesnar match at Summerslam. 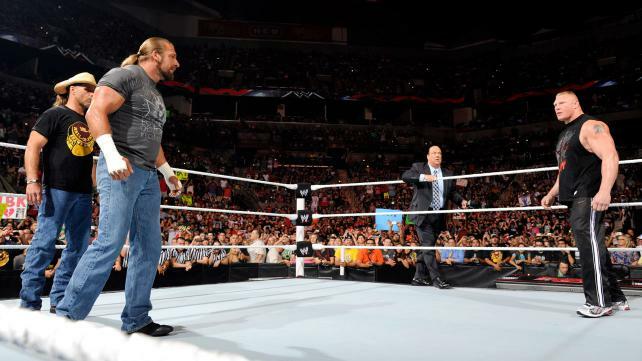 HBK was cut off by none other than Lesnar, followed close behind by Paul Heyman. Luckily, before Lesnar could break Michaels in half, Heyman began to talk, telling Michaels that everybody should be interested in Michaels’ opinion as to who will win at Summerslam. However, Heyman goes on to tell Michaels that his opinion is not needed for this match since Lesnar will not be “Entertaining” (Ouch), but rather to fight The Game in Los Angeles. Michaels tells Heyman/Lesnar that the Triple H he has seen in the last few weeks is a crazed man out to destroy Lesnar. He furthers that statement by saying that not only is he backing his friend at Summerslam, but he will be in Triple H’s corner for his match against Lesnar. Lesnar chimes in by saying that the only reason HBK can say that Triple H will win is because he has never faced him in the ring. Before things could get really ugly, The Cerebral Assassin came to back up his DX brother. The three men stood off in the ring, forcing a laugh from Lesnar. Before he exited the ring, Lesnar tells Triple H that he will see him at Summerslam, and that he will see HBK sooner than that. One can only speculate as to what that means, but many feel as though it can’t be good. My instincts tells me that we may see Michaels betray his long time friend and set up a major match at next years Wrestlemania. But I could be wrong. Michael Cole updates the situation involving Sheamus’ joyride with Del Rio’s Ferrari. Since he stole the ride earlier in the show, Sheamus has made his way over to San Antonio’s famous Alamo, where he delivers a Tout. 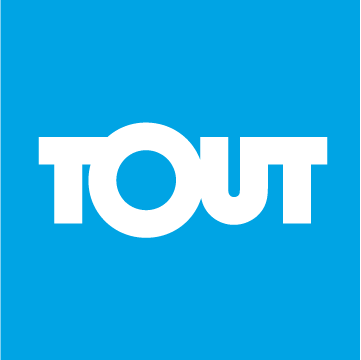 Stop trying to make Tout happen. It’s never going to happen. After the break, we see that Sheamus has returned Del Rio’s car to the arena, and not exactly in the same condition as when he took it. The Ferrari is smoking, covered in mud, and apparently the smell of Sheamus’ Mexican food farts. As one can assume, Del Rio isn’t to thrilled about the situation, storming off to find Sheamus and leaving Rodriguez to clean up the mess that the World Heavyweight Champion had left behind. CM Punk made his presence known right after Cena’s victory, coming down the ramp to deliver a threat to Cena. This was followed by their opponent at Summerslam storming down to the ring to cause havoc. Cena managed to get Show prepped for an A.A, but Punk interjected, knocking both Cena and Show to the ground. The WWE Champion then went to the announcer booth to proclaim that maybe John Cena is right, and the reason why Punk isn’t getting the respect he deserves is because he is letting people walk all over him. He announces that he will no longer play the role of the nice guy, and re-enters the ring to finish his Summerslam opponents off. Show has other plans however, as he caught Punk’s high kick and responded with a WMD to the champ. He followed that up by giving Cena a WMD of his own. The show went to black with Big Show standing over both Punk and Cena while holding the WWE Championship. Well, this week was better than last week. There was more matches, and far less use of repeated promos. Last night’s show felt a lot meatier, and it didn’t make me hate the extra hour of content. Things are only going to heat up on Monday Night RAW as Summerslam nears, and I’ll be here to talk about it all. Until next week, this is Brandon from Off the Top Rope, tapping out for now! ~ by Brandon Gnuschke on August 7, 2012.